A poll in St. John's West puts the Liberals 42 points up from the last provincial election. Province wide, the party may make even greater gains. The federal Liberals swept all before them in Newfoundland and Labrador in the election of Oct. 19, and their provincial cousins look capable of almost repeating the feat in the vote on Nov. 30 as a new poll conducted in one battleground district shows the scale of the swing taking place in the province. 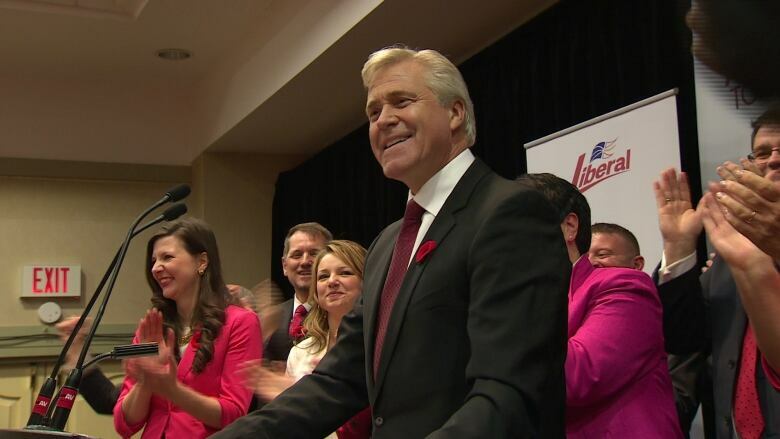 The poll, conducted by Abacus Data for VOCM in the district of St. John's West, put the Liberals' Siobhan Coady (a former MP) ahead of the pack with 57 per cent support among decided voters. She was followed at a distance by Earle McCurdy, leader of the Newfoundland and Labrador NDP, at 24 per cent. The Progressive Conservatives' Dan Crummell, the incumbent and a cabinet minister in Paul Davis's government, placed third with 19 per cent support. The margin of error among decided voters, at about +/- five per cent, 19 times out of 20, puts little doubt as to the lead that Coady has over her rivals. This represents a massive shift in support in this district. Newfoundland and Labrador has seen its number of seats reduced from 48 to 40, but after transposing the results of the last two provincial elections it becomes clear just how much movement is taking place in this district — along with the rest of the province. 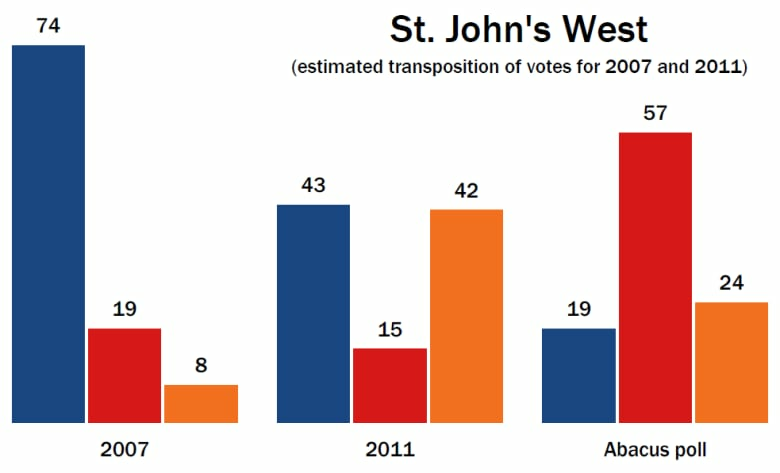 Estimated vote share in 2007 and 2011 elections in St. John's West, compared to the findings of Abacus Data's poll. The PCs won the equivalent of St. John's West with 74 per cent support in 2007, giving them a 55-point lead over the second place Liberals. In 2011, Crummell would have narrowly held the district for the Tories with its current re-drawn boundaries with 43 per cent support to 42 per cent for the NDP, while the Liberals would have seen their vote drop to just 15 per cent. But if the Abacus Data poll holds true, the Liberals will have experienced a gain of 42 points in this district, taken in almost equal parts from the PCs (24 points) and the NDP (18 points). This kind of local movement has been echoed in the province wide polling conducted in Newfoundland and Labrador. Polls published during the campaign so far have given the Liberals between 65 and 74 per cent support, with the PCs trailing at a distance with between 17 and 21 per cent and the NDP third with between nine and 15 per cent support. Compared to 2011, this represents a gain of between 46 and 55 points for the Liberals. Unlike in St. John's West, however, a significant majority of the Liberals' gains have come at the expense of the PCs, who are down between 35 and 39 points. The NDP, by comparison, has dropped between 10 to 16 points. As this district poll makes clear, however, that is more than enough to make McCurdy's prospects of leading his party from a seat in the House of Assembly slim. The dramatic scale of this movement in public opinion is unprecedented in Newfoundland and Labrador's history. Though the big victories that Danny Williams and Kathy Dunderdale won in the last few elections may give the impression that landslides are common in the province, historically elections in Newfoundland and Labrador have tended to be more competitive. Popular vote results in Newfoundland and Labrador elections, with ThreeHundredEight.com projection as of Nov. 13, 2015. 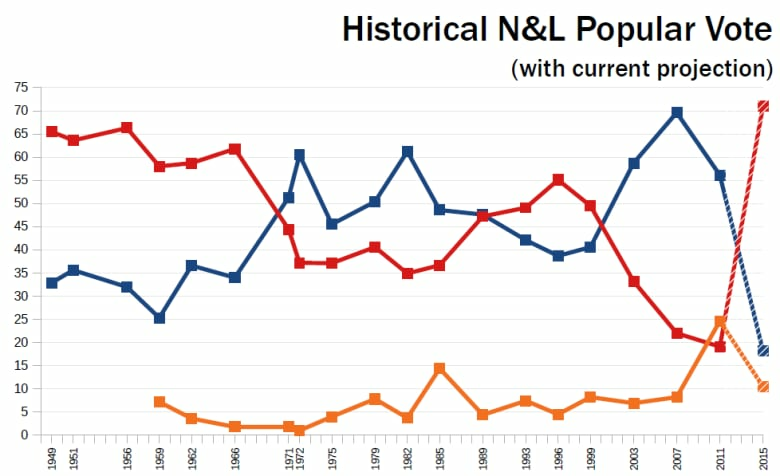 As the chart above shows, this kind of shift from one election to another is greater than anything that Newfoundland and Labrador has seen before. The question remains, then, whether or not the Liberals' Dwight Ball will manage to make good on his poll numbers. A huge majority of Newfoundlanders and Labradorians believe that the Liberals will prevail, which may have an impact on turnout. And Ball's leadership numbers over Davis, while significantly better, show a tighter race than the voting intentions polls do. Nevertheless, the Liberals have been leading in the polls in the province by significant margins for over two years, and the potential for a landslide did not deter voters in last month's federal election, as the number who turned out to vote increased from 2011. A win by some 50 points for Ball's Liberals on Nov. 30, with only a few seats, if any, left to the opposition, remains a very real possibility. The poll by Abacus Data was conducted for VOCM, interviewing 500 residents of St. John's West between Nov. 8 and 12 via telephone. The poll carries a margin of error of +/- 4.5 per cent, 19 times out of 20.